Recipes and Lessons to help you stay connected with your iPhone. Tap or click on any title to retrieve the full online lesson. Email is essential for connected Seniors. It is a free and fast way to send and receive messages with friends, families and more. 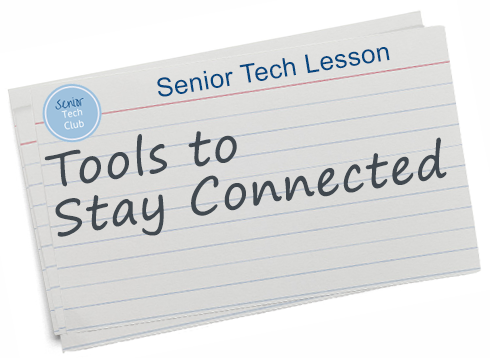 It is essential for online shopping, banking and engaging with the Senior Tech Club. Let’s get started with this email recipe. Many of us use texting as a basic communication tool. Even our children and grandchildren seem to respond better to texts than phone calls. We can also use texting to stay connected with friends. It’s just an easy way to stay in touch. The Message app on your iPhone and iPad is able to take our texts beyond the basics and allow you to add celebratory flair to a standard text message. In this recipe, you will learn about three enhancements that will add flair to text messaging, 1) Special Animation Effects, 2) Tapback Responses and 3) Handwriting a message. Making video calls with FaceTime is a great way to connect with friends and family. And it is installed and ready to connect with a single tap. This recipe will demonstrate the basic call functions. Texting with your phone has become essential in order to communicate with families and friends. In addition to basic communication, we are now seeing all kinds of services offered via text or text-like services. This includes text banking, numerous payment services, delivery notifications, restaurant reservations and more. For Seniors, texting is also a way that children and grandchildren can send the pictures of their lives. The Messages apps on your iPhone provides access to the world of texting and iMessages. This recipe will review the basics.